In our fast-paced, virtual, modern age, relationships have greatly transformed from what they were not so long ago. As culture and arts morph and evolve there remains a nod to a time when real, genuine, personal connection was the crux of our society and social interactions. Yet, behind the digitalization and hype of new and emerging technology we find thoughtful handmade crafts are still alive and well. In many instances these crafts and art forms are thriving. 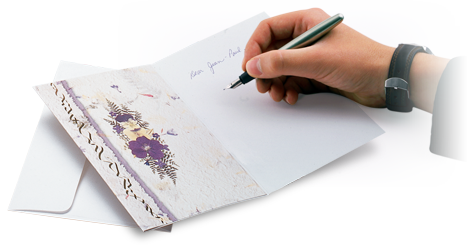 We are beginning to see a re-emergence of a movement of gratitude, heartfelt sentiments, and simple pleasantries of physical greeting cards, thank you cards, and letters. This trend of gratitude and re-emphasis of social etiquette caught the attention of the New York Times, as even the most famous among us slow down enough to send a thank you note. A handwritten note demonstrates a pause in time and a valuing of the relationship at hand. Since 1975, Creative Graphics has produced timeless, creative works of art from real pressed flowers and natural paper. Our designs seek to act as a vibrant reminder of nature’s beauty and to inspire our customers to slow down, connect, and reflect. Creative Graphics has designed an exciting collection of beautiful note cards, thank you cards, bookmarks, journals, address books, notebooks and memory books to preserve heritage, and enhance memories, and share treasured sentiments. Our inspirational gifts and stationery are handcrafted with real pressed flowers grown from small farms in Oregon. Each season we explore new designs and products to inspire, uplift and connect our customers to the everlasting grace and beauty of nature. We hope you’ll enjoy some of our products we’ll showcase here at our blog Grace Filled Living. Roses the flowers of love?